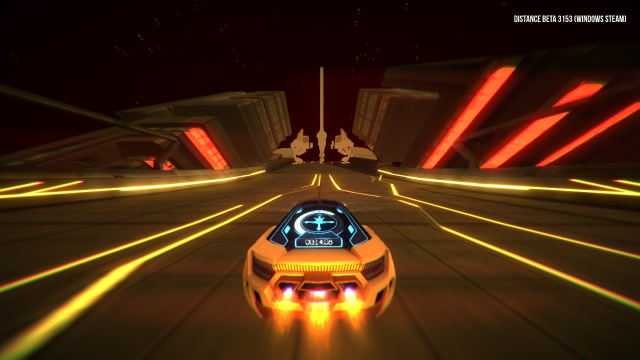 Seattle-based Indie Game Developers, Refract Studios, has released an update recap video to their Survival Racer game, Distance. The video reveals new features from the latest build, Build 3153, which contains four new Challenge mode levels, and procedurally generated spectator mode, you will now be able to restart even faster on each level, plus more modifications and bug fixes. In Distance, you get to go into a mysterious world that takes place between an arcade racing experience to an exploration experience. Take on a jetcar that allows you to boost, jump, rotate, and yes of course fly through a chaotic city. Back in August, Distance went out on private beta for PC, Mac, and Linux, which went to the over 6,000 backers last month after 2 years of development. The beta at the moment allows for players to do single player campaign, but also split-screen and online multiplayer modes such as Sprint, Reverse Tag, Stunt, and Soccer. The tracks you get to experience are created by users themselves via the Steam Workshop. As we mentioned in our previous article for Distance, Refract will be bringing it to Steam Early Access this fall, and there is still no exact date that has been announced. Though you can pre-order the public beta (Early Access) release of Distance, which will give you instant access to behind-the-scenes updates. You can learn more on their official site, http://survivethedistance.com.